Christina was born in Northamptonshire, and at the age of 7 moved down to East Sussex with her family, taking up the trumpet at age 11. Thanks to the opportunities offered by East Sussex Music and Ringmer Community College, she quickly gained a variety of ensemble experience, playing for the South Downs Youth Concert Band, South Downs Youth Orchestra, East Sussex Brass Band and East Sussex Youth Orchestra among others. 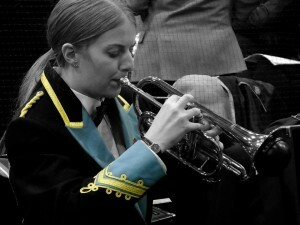 She studied music at the University of Southampton, and now works for East Sussex Music as a brass tutor. Christina joined LGB Brass in 2009, where she has played cornet on the front row, followed by a brief stint on soprano, and most recently principal cornet (any excuse to be bossy!). She is married to Adam Kearley, a former LGB cornet player, and enjoys collecting pretty scarves, early-morning cornet practice, and occasional 5k runs.